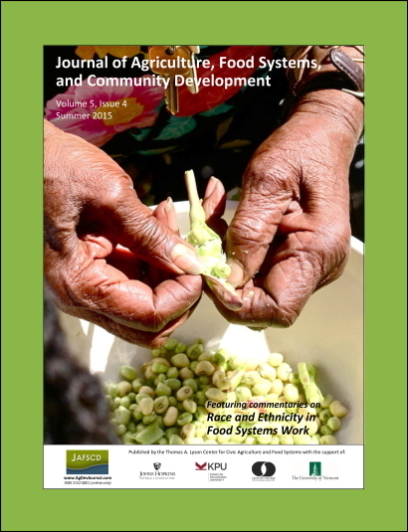 In this commentary we very briefly highlight farming- and land-related historical injustices impacting African Americans, and outline useful ways for racially diverse food justice organizations, activists, and academics to collaborate on place-based interventions in an equitable and inclusive way. Place-based strategies to address inequity in the food system must begin with an equitable and inclusive environment within which residents can engage in developing solutions. Equitable and inclusive civic engagement can build capacity, trust, and empowerment in marginalized communities, creating an environment where communities can enact transformative local food system change using their own resources. Transformative change is change that occurs at the very core of ourselves as individuals and in our communities. Such change requires us to reexamine our long-standing customs, assumptions, beliefs, and institutional practices, moving community conversations towards those that build relationships, foster mutual accountability, and strive for respectful understanding among neighbors and neighborhoods. Transformative change doesn't come easily. However, practicing equitable engagement can help build capacity for sustaining change. Alternative food movement scholars and activists can lift up and build on community assets, but to do so requires historical understanding, recognition of individual and community strengths, and work to build long-term relationships of trust. Kirwan Institute for the Study of Race and Ethnicity at the Ohio State University; 33 West 11th Avenue; Columbus, Ohio 43201 USA. Professor of Entomology, College of Food, Agriculture, and Environmental Sciences, The Ohio State University, Wooster Campus; 1680 Madison Avenue; Wooster, Ohio 44691 USA. Assistant Professor of Public Affairs, John Glenn College of Public Affairs, The Ohio State University; 1810 College Road; Columbus, Ohio 43210 USA. Post Doctoral Researcher, City and Regional Planning, Knowlton School of Architecture, Ohio State University; and Kirwan Institute for the Study of Race and Ethnicity, The Ohio State University; 275 West Woodruff Avenue; Columbus, Ohio 43210 USA. Assistant Professor, Medical Dietetics, The Ohio State University College of Medicine; 453 West 10th Avenue; Columbus, Ohio 43210 USA.